Treasures from Heaven: Don't tempt fate! Today I remarked to Tane how 'amazing it is that Ella-Rose hasn't figured out how to climb out of her bassinet'. 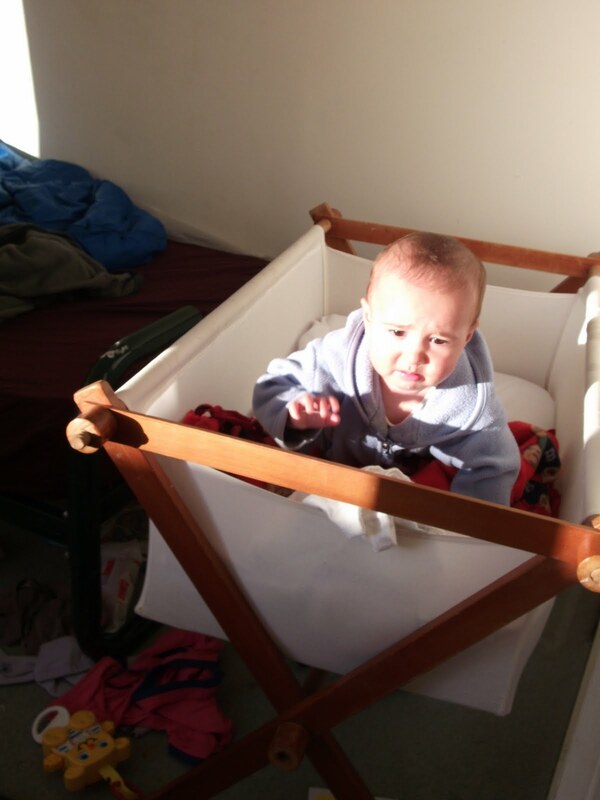 I mean, its pretty good because we have sold her cot, and even though she is almost 8 months old, we have no other alternative. I watched her on the floor when I laid her on her back. She simply rolled herself onto her front and pushes herself into sitting position. 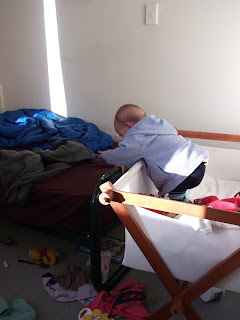 She is also pretty good at climbing up things now... so I was pretty surprised she hadn't done it in her bassinet. She just lies there and cries if she doesn't want to go to sleep. That is, she did... until now. SO when she started getting tired after lunch I did the usual sleep-time routine: wrapped her up, gave her her dummy and teddy, gave her a kiss and and said goodnight. She made a few of the usual grizzles... I could hear her as I was re-packing boxes (re-packing!... that's right... re-packing!... because it is an almighty sin to post things to Australia in fruit boxes!... especially banana boxes!... apparently!). Anyway... all went quiet for a few minutes so I ASSUMED she was asleep. Then I heard a loud thud which I expected would be followed by an even louder cry... but that didn't eventuate. So I opened the door and had a peek and this is what I saw. Then she saw me... and was not happy. I re-settled her down again and when I went to check on her... she had fallen asleep. But she was sitting up. This time I didn't rush for the camera... I thought she had stopped breathing or something... I laid her down and she started to cry again... So I got her up and fed her some spaghetti. Later that evening when I put her to bed she just went out like a light, as though she had forgotten her new-found discovery. Long may that last... or at least for the next 2 weeks.